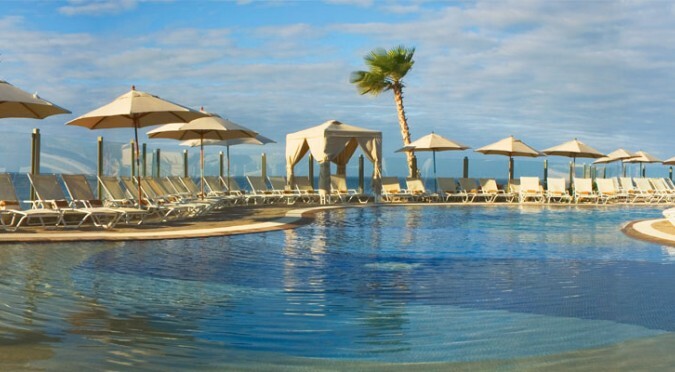 Long-established as one of North America’s premier vacation destinations, Pueblo Bonito Resorts continues to celebrate three full decades of world-class service, and we must say, 30 has never looked or felt this good. The latest honors to come our way arrive via the elite travel publication Condé Nast Traveler, whose subscribers have bestowed their coveted Readers’ Choice Awards for “Top Resorts in Mexico” on not just one, but four Pueblo Bonito properties: Pacifica, Los Cabos, Sunset Beach, and Emerald Bay. As an adults-only location, Pacifica is the ideal romantic getaway. It’s also the ideal place for lovers of golf, who inevitably fall head-over-heels for the breathtaking Jack Nicklaus-designed course at Quivira Golf Club. Sunset Beach, where family-friendly fun abounds, shares an expansive pristine stretch of beach with Pacifica, also offering a great option for golfers. The Los Cabos Beach Resort, with its enchanting Mediterranean-style architecture, is located on Médano Beach, the must-visit, safe-for-swimming beach in Cabo. In nearby Mazatlán, Emerald Bay Resort & Spa’s elegant gardens and neoclassical design set the standard for all-inclusive luxury on the mainland. Many thanks to the readers of Condé Nast Traveler and to all our faithful guests, whose expectations we strive to exceed every day at Pueblo Bonito. Book your escape to our award-winning resorts today!